Explore the true Egyptian treasures and have it delivered to your door. We offer some of the world's most beautiful Egyptian Jewelry, Personalized 18k Gold and Silver Cartouches, Gifts, Cartouche Jewelry, 18k Gold and Silver Bracelets, Statues, Papyrus, Egyptian Art and other collectibles that capture the beauty and history of Egypt.Is the right place to feel Egypt and touch everything you like most about Egypt. We offer the most unique Egyptian Cartouche Jewelry and Gifts at the best prices, Guarantee! 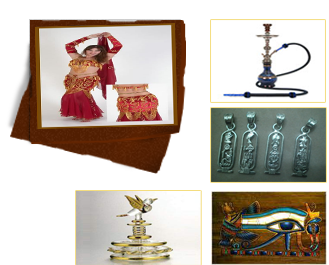 egyptomaniais the world's #1 hookah and hookah tobacco shop with the guaranteed best prices, highest quality products and most helpful customer service in the world. As the leading online hookah store in hookahs, hookah accessories and hookah parts we carry the widest variety and most popular flavors of shisha tobacco. Combine that with our price matching guarantee, speedy delivery and outstanding customer service and you can see why we are able to serve your hookah needs better than any company in the world. 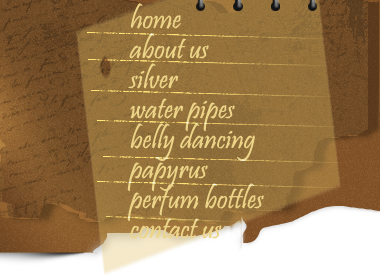 Papyrus is the material that is made from the fibers of reeds that grown on the banks of the Nile River. It was manufactured as early as the first Egyptian Dynasty, circa 3,000. The Egyptians used papyrus for 4,000 years. “Ground paper” eventually replaced papyrus for economic reasons, although manufacturing of papyrus continued until the end of the 11th century. Today it is still manufactured on a small scale, and primarily for art!